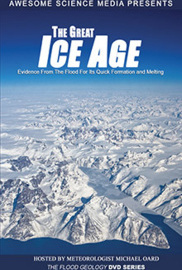 Michael J. Oard explores the evidence for only one Ice Age caused by the global Flood just a few thousand years ago. He also looks at the associate mysteries of the Ice Age. then how a catastrophic melt off transpired in only 50-70 years. He’ll also share why only one Ice Age explains many associated mysteries such as the extension of the woolly mammoth and other mammals, massive permanent climate change, and the spread of man and animals after the Flood. He’ll show how the Biblical record makes much more sense of what we find the in the geologic record. Download All Three Flood Geology Documentaries!